We have so much junk in this house it makes me crazy, but I’m also too lazy to actually do anything about it. Last week I decided to get down that ol’ milk crate full of hats, scarves and gloves and sort though it. 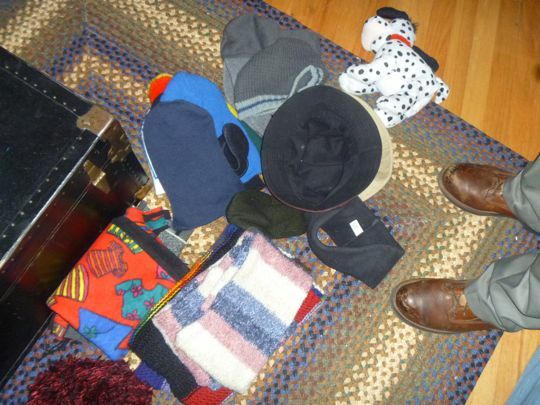 Then I went through a similar process with the hats and scarves – making piles of ones to keep and those to give away. Some of those hats have never been worn. Then the television was on so I put it all back in the milk crate and watched my stories instead. So much for progress. That seems like a good job for January. I’m impressed that you have a collection like that. I seem to have to buy a new hat every two years or so, and I have no idea where the old ones go. I think they’re in that crate. 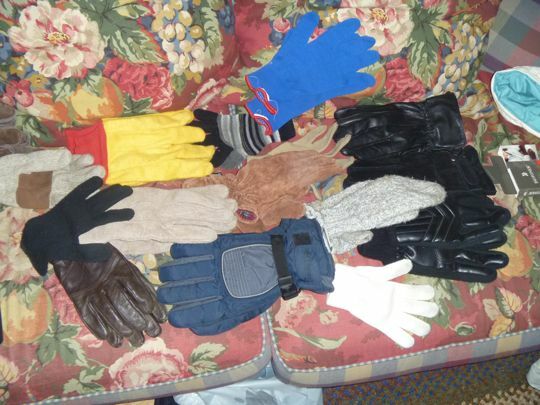 I always debate when I should just give up hope and throw out those matchless socks/mittens. Generally I find a match within 24 hours of getting rid of them. Into what category does the dalmatian fit? “Disturbing puppets” Don’t ask where your hand goes. Throw them all away. Who’s kiddin’ who? I knew I guy who collected heels that had fallen off of shoes. He’d find them everywhere. He called them ‘lost soles’.